As I mentioned previously, I am anxiously awaiting the arrival of my first niece or nephew. (Though perhaps not quite as anxiously as my still pregnant sister-in-law--you're almost there!) And so, my eyes wander to all things sweet for the littlest ones. 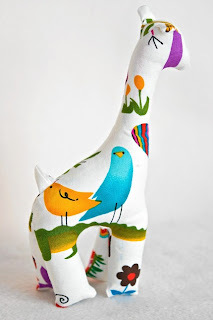 Today, I found this unbearably cute Teething Giraffe from StarbrightBaby's Etsy Shop, via the very sweet Little Willow. I'd like to order about a dozen and set up a whole cloth giraffe menagerie! Adorable!